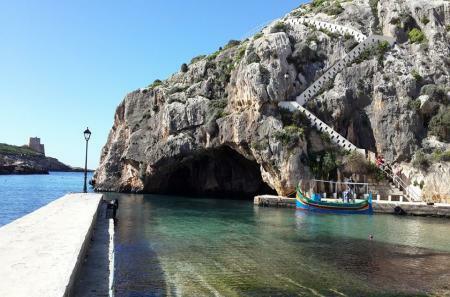 Full day or Half day sightseeing tours on Gozo. 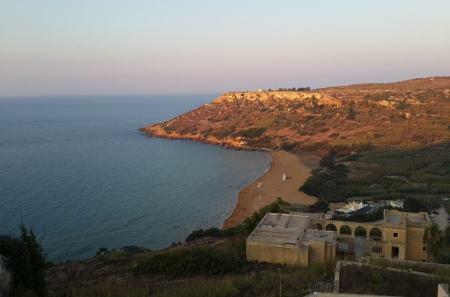 Gozo, the island of JOY, even though it is small in size, it has a lot to offer so it is best explored by car also because it is mostly hilly and temperatures can get too hot or too cold as well. We have the following tours designed to cater for different styles, while keeping the traditional charm of our lovely island. All our tours are private and chauffeur-driven. Apart from the following tours, you also have the option to create your own tour. We also offer the flexibility to arrange the tours to your liking. This tour is ideal for anyone who wishes to have a taste of Gozo in one day and explore the main highlights of the island. The tour will start off with a scenic drive through Munxar on the way to Xlendi where you will stop for some time to savour the view and also for some photos. Here you can admire the cliffs. Then we head over to the Kantra Valley where you can get off for a small walk and check out the tower. Further down you can also have a walk along the cliffs in Xlendi. A UNESCO World Heritage Centre situated in the middle of Gozo. The fortified town was built circa 1500BC and holds most of the island’s history. The driver will leave you at the entrance of the Citadel for you to explore. Entrance to the Citadel is free, however, entrance to most of the museums inside the Citadel and the Cathedral are against a fee. We suggest taking a walk through all of the Citadel as well as visiting: The Cathedral, The Old Prison, The Grain Silos and The World War II Shelter. Famously known for the miracles attributed to the grace of Our Lady of The Assumption to whom the previous chapel was dedicated. People from all over the world visit the shrine for offerings and blessings. The newly built church, built around the old chapel, is a splendour on its own with sculptures and craftsmanship in Maltese stone, also with mosaic walls outside of the church. A series of 14 marble statues representing the Via Crucis or Way of the Cross run up the hill opposite the church. Enjoy a walk through this traditional town along the narrow alleyways with colourful balconies and authentic facades. We stop here to witness the artistic capability of our local artisans. You can enjoy the making of local products such as silver filigree, lace, pottery, leather, stone and glass. If you want to take back with you a local souvenir, then this is the place. The Crafts Village is not open on Sundays. Alternatively, if you book this tour on a Sunday, the driver will take you to a local open market. The Arch at Wied il-Mielah is the new attraction following the fall of the famous Azure Window. One can also witness here the magnificent coastal views the island has to offer. Beautifully designed in geometric patterns, 3km along the coast in Marsalforn, the place where most locals get their table salt from. Also a UNESCO World Heritage site, standing there boastfully since circa 3600 and 3200BC, beating the pyramids of Egypt in age. The temples are a megalithic temple complex from the Neolithic period. We will stop at one of the places for traditional pastizzi (cheese and pea cakes) and coffee. This tour focuses mainly on picturesque sites around the island of Gozo, consisting mainly of cliffs, caves, gardens and other landmarks that you won’t find anywhere else. This tour is ideal for nature lovers. If you love landscape photography, there will be plenty of opportunities to capture great photos. 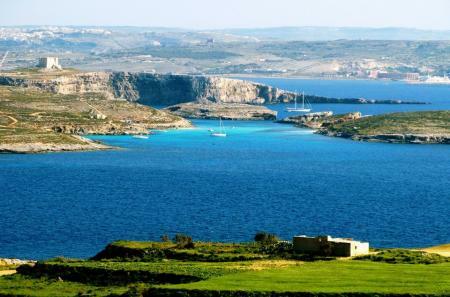 One of Gozo’s charms, a small sandy beach with clear waters, enchanted by stunning views of Comino and Malta. Next, the driver will take you to the village of Nadur, where the famous grotesque carnival is held every year in February. You will pass through the Nadur Belvedere, on the way to Ta’ Kenuna Tower. The tower was built in the British era and was used to pass on signals to ships and other posts via a telegraphy link between Gozo and Malta. The driver will stop you here to visit the tower and the botanical garden that surrounds the tower. Here you can find a number of plants native to the Maltese Islands. Small cave overlooking the golden red sands of Ramla Bay. Legend has it that this is the same cave referred to by Homer in The Odyssey where the nymph goddess Calypso kept Odysseus as a prisoner of love for seven years. The driver will stop you at the bottom of the hill near the lighthouse, which overlooks the traditional small village of Ghasri. There is a stunning 360 degrees panoramic view from the top. If you’re lucky to find the lighthouse attendant there, he may even allow you to take a look inside, and perhaps climb the spiral staircase to the top of the lighthouse. Famously known for the miracles attributed to the grace of Our Lady of The Assumption to whom the previous chapel was dedicated. People from all over the world visit the shrine for offerings and blessings. The newly built church, built around the old chapel, is a splendour on its own with sculptures and craftsmanship in Maltese stone, also with mosaic walls outside of the church. A series of 14 marble statues representing the Via Crucis or Way of the Cross run up the hill opposite the church. More time can be given here to climb up the hill and enjoy the view from the top. There’s a lot happening in this area. The driver will drop you here to explore the area on foot. This is the location where the beautiful Azure Window stood prior to her fall during a storm in March 2017. This is also the famous location from the Game of Thrones’ Dothraki Wedding scene. You can also visit the medieval tower (entrance at a donation). This tower was used in the times of the Knights to guard Fungus Rock from anyone trying to collect the fungus melitensis (Maltese Fungus) which was believed to have unique medicinal properties. Probably the best spot on the island for sunsets. There’s a short 10 min walk from the road to the cliffs, where you can witness the majestic cliffs that surround the island. Just sit there to wind up your day in the quite surroundings hearing the sounds of the sea gulls. This tour is tailored for any individuals or groups whose main reasons for visiting the island of JOY is connectivity, spirituality and meditation. This tour is ideal for groups coming to the island for retreats. However, it can also be offered to individuals and smaller groups. This tour is ideal for groups coming to the island for retreats. However, it can also be offered to individuals and smaller groups. A UNESCO World Heritage site, standing there boastfully since circa 3600 and 3200BC, beating the pyramids of Egypt in age. The temples are a megalithic temple complex from the Neolithic period, a renowned sacred site. Many meditation groups visit this place to carry out techniques of mental concentration for religious, philosophical or spiritual purposes due to the vibrational energy from underground. The tour will allow time for meditation at this place. The tour proceeds with a 20 mins walk along the fields to reach the hidden Mixta Cave. The cave overlooks the famous golden Ramla l-Hamra Bay. This spot is still a hidden treasure and is mostly know for the stunning view and for the serenity and grounding one feels in this place. The rocks inside the cave are crystalline, composed of crystals. Famously known for the miracles attributed to the grace of Our Lady of The Assumption to whom the previous chapel was dedicated. People from all over the world visit the shrine for offerings and blessings. The newly built church, built around the old chapel, is a splendour on its own with sculptures and craftsmanship in Maltese stone, also with mosaic walls outside of the church. A series of 14 marble statues representing the Via Crucis or Way of the Cross run up the hill opposite the church. You can also go up the hill through Via Crucis on foot for meditation. There is a quiet spot overlooking Gozo in 360 degrees. The biggest church in Gozo and the third largest unsupported dome in the world. It is built on a prehistoric site and built in a circular structure like the temples as the dome’s round shape amplifies the energy. This church is very unique as, unlike other churches, it has a very clean energy as there are no statues with blood like we usually see in churches, so even people who are not Christians meditate in this church for the positive energy it has in it. It is said, that this Church is also built on the earth’s ley lines. Ley lines are places of ancient religious significance or culture, often including man-made structures. They are ancient, straight 'paths' or routes in the landscape which are believed to have spiritual significance. Probably the best spot on the island for sunsets. There’s a short 10 min walk from the road to the cliffs, where you can witness the majestic cliffs that surround the island. There is a surprise for you once you reach the cliffs. Just sit there to wind up your day in the quiet surroundings hearing the sounds of the seagulls.